Analyst firm Gartner has released its Q3 2010 smartphone estimates, and things are getting downright ridiculous for Android, which has seen 628 percent growth over Q3 2009 and is now the No. 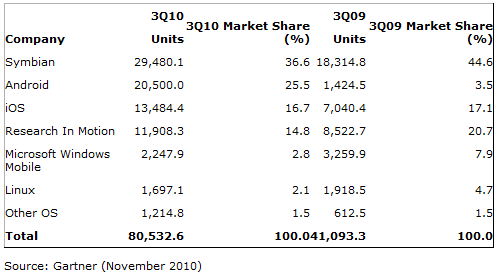 2 selling smartphone OS worldwide for Q3 2010. There were some 20 million units sold to end users (that’s you and me) in the third quarter, compared to 1.4 million in the third quarter of 2009. I’ve been saying for months now that the it’s the 80’s all over again. While I still think Apple’s iPhone has the most polished and usable interface, unless they make dramatic changes in how they sell the iPhone the writing is on the wall. iPhone won’t go away, but without multi-carrier/multi-form-factor for iPhone there will be no stopping the Android juggernaut. Industry executives and Wall Street analysts are criticising Google for being short-sighted and focusing too intently on online advertising, accusing the search giant of being a “one trick pony”. Google doesn’t have a problem with that label however, even its CEO Eric Schmidt agrees, stating “I think that’s probably true”. Clearly he’s on the mark… in the second quarter of 2010 alone, Google posted revenues $5.1 billion with advertising accounting for 96% of its revenues during that period, 66% of its total revenue in Q1 and Q2 combined. Apparently, Google isn’t sitting still in the emerging mobile ad market as they are shooting for a billion a year with the help of its Android operating system. Schmidt has been quoted saying: “If we have a billion people using Android, you think we can’t make money from that?” – If you think about it, that’s just $10 per Android user. With Google setting its sights on recommendation engines, building Admob (its mobile advertising platform) and incorporating location-based advertising, it certainly could achieve that. While Android has matured very rapidly some see the real problem is customers not going back to Android if the handset makers use different versions of the OS as a marketing tool. Android 2.2 is rocking better Exchange support and portable hotspot capabilities. Both are big deals for perspective buyers, particularly the former as Exchange integration means business customers can use their handsets for work. But when handsets come to market running Android 2.3, you can bet the people stuck on 2.2 are going to feel shafted. When their contracts are up, a lot of those people may jump to the iPhone or something else where they always know that they’re going to at least be capable of running the latest software. Of course handset makers could fix this problem by hiring more coders (or we as users could simply root our phones and run custom ROMs) and pushing out updates faster. However, it’s usually the case that handset makers would prefer to spend resources on the NEXT phone rather than keeping their older phones up to date. 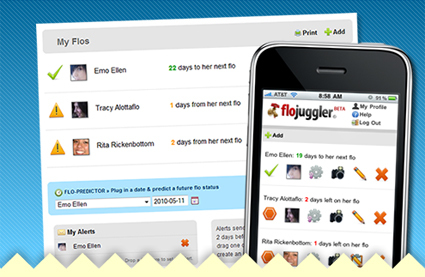 Flojuggler is “an application designed to track the menstrual cycles of multiple women.” SERIOUSLY?!?! That’s an app for THAT?! Not sure if Flojuggler is right for you? Go watch the “demo video” and you’ll immediately realize the only thing worse than the kind of guy who would actually use this app is the kind of guy who created it. Mad props on the name of the app though.